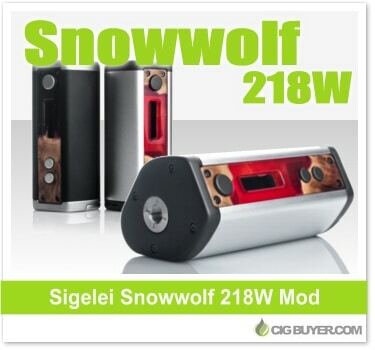 The Sigelei SnowWolf 218W Box Mod is the latest high-powered offering from Sigelei. As the name implies, it offers up to 218W of output with an advanced temperature control suite and five different TC modes with Preheat Power adjustment. It runs off three 18650 batteries, includes a 5-coil memory bank, resistance lock and TCR/TFR functionality. The Snowwolf 218 is not only advanced, but it’s super attractive with an ergonomic chassis and a stabilized wood face plate that makes each device unique. It has a classic 3-button interface, OLED display, sliding battery door and spring-loaded, gold-plated 510 with SS threads.